The RT-AX88U features a 64-bit 1.8GHz quad-core processor as well as two USB ports and eight Gigabit LAN ports. 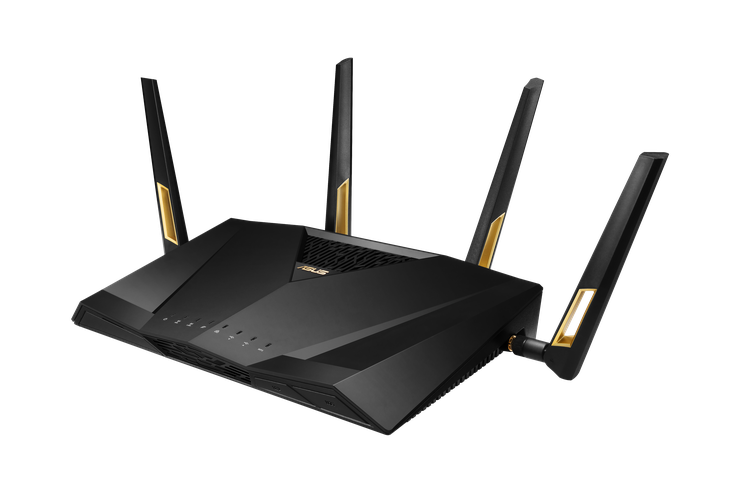 The RT-AX88U also features built-in software, including QoS and Gamers Private Network (GPN) powered by wtfast to accelerate online gaming, AiMesh for creating a whole-home mesh Wi-Fi system, and AiProtection Pro, commercial-grade network security powered by TrendMicro to keep users and all their connected devices safe from online threats. The ASUS RT-AX88U supports 160MHz bandwidth and 1024-QAM to provide Wi-Fi speeds of up 6000Mbps. The RT-AX88U features a combination of OFDMA and MU-MIMO technology that provides up to 4X better network efficiency and capacity, according to ASUS. With OFDMA, the data channel is separated into smaller sub channels, so data from different devices can be bundled together. This means that one channel can transmit data to several devices at the same time. These smaller sub channels enable RT-AX88U to provide up to 80% greater coverage than previous-generation routers. According to ASUS, the 802.11ax Wi-Fi standard helps to improve battery life of connected devices. A new technology called Target Wait Time (TWT) allows transmissions to be scheduled, so connected devices can sleep for longer periods, delivering up to 7X better battery life. The ASUS RT-AX88U will be available from 15th October for $569.